Despite facing indictment for fraud and breach of trust, Israeli Prime Minister Benjamin Netanyahu's coalition appears to have held on to their majority in Tuesday's federal election, according to media reports. Should Netanyahu return for a fifth term (his fourth consecutive since he was first elected PM for one term in the 90s before running and winning reelection in 2009) as prime minister, making him a lock to become the longest serving leader in Israeli history come July, the conservative firebrand and Trump ally plans to make history again by moving ahead with plans to annex parts of the West Bank, while also becoming the first sitting prime minister to officially be indicted on serious criminal charges while in office. Thanks to a historic low voter turnout among Arab Israels, who have reportedly become disillusioned with the country's politics after the passage of a bill officially declaring Israel to be the 'Jewish homeland', according to the NYT. 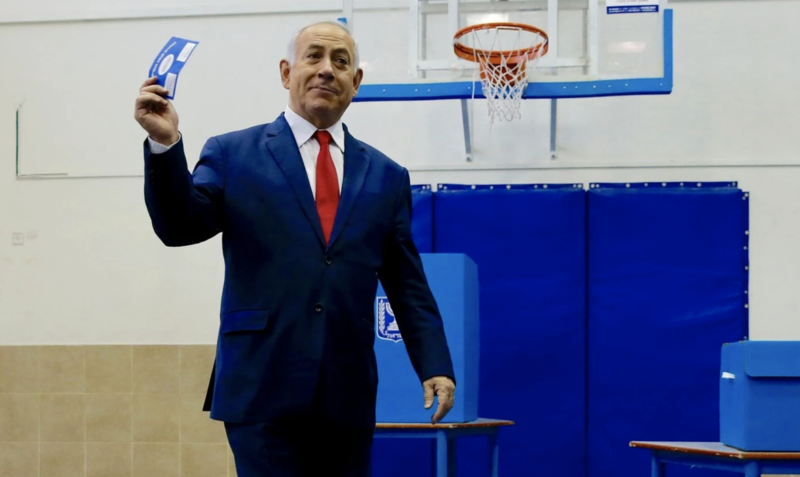 Bloomberg reports that Netanyahu’s Likud party and the Blue and White bloc lead by centrist former military chief Benny Gantz each won about three dozen of parliament’s 120 seats. However, together with other right wing and religious parties, a Netanyahu-led coalition has likely secured a total of 66 seats in one poll, and 64 according to another. A third showed the two blocs effectively tied, but with so many small parties running close threshold the results could still change. Netanyahu has already declared a decisive victory on Twitter. Posing one of the greatest threats in the embattled prime minister's 13 years in office, Gantz has the defense credentials that the Israeli electorate demands. He also has a clean image, which contrasts him with Netanyahu. Gantz had signaled he'd push for restarting peace talks with the Palestinians, while Netanyahu, who earned condemnation from the UN for Israel's violent crackdown on protesters in Gaza, has chosen to strengthen ties with Saudi Arabia and other Middle Eastern states - ties that have been built on a mutual mistrust of Iran. Roughly 6.3 million Israelis were eligible to vote for the 120-member Knesset. The final vote tally won't be released until Thursday (local time), and President Reuven Rivlin won't assign a party to start building the next coalition until next week.